A seismic shift has occurred within the wireless industry: wireless operators are funding fewer in-building wireless projects. This trend informs that – among other things – the large venue market segment, which includes stadiums, convention centers, subways and airports and has traditionally been the “sweet spot” for carrier-funded cellular enhancement network deployments, is saturated and that the economics does not entice carriers to address mid-sized venues such as hotels and hospitals as well as higher education, retail, corporate and multitenant high-rise buildings. The total of such mid-sized venues represent an addressable market having 16-times more venues, according to statistics from the Energy Information Administration, a branch of the U.S. Department of Energy. It means that the places where we live, work, shop, vacation, receive health care and attend school are at risk of being left behind. No greater void exists than in higher education where uber-connected students depend on smartphones for academics, socializing, staying in touch with family and friends, entertainment and safety. Indeed, macro towers, micro cells and outdoor distributed antenna systems have been deployed on or near large urban and rural university campuses. Similarly, DAS networks are frequently installed in Division I football stadiums and basketball arenas. However, the buildings that are used every day where students live, study, take classes and socialize often suffer from spotty or, worse, no cellular coverage. Additionally, most mid-sized universities or institutions that do not have a high-profile football program have not and will not garner interest from wireless operators to address cellular coverage issues. This is a problem whose urgency is growing. At a conference earlier this summer, an ICT director at a Division I university issued what amounted to be a cry for help for creative solutions to provide coverage inside residential buildings and student dormitories – underscoring the need through an account of a parent and major donor whose frustrations over being unable to reach her daughter reached the desk of the university chancellor along with a clear message: fix it or lose my funding. In order to overcome these dichotomic outlooks, universities must take steps to control their own wireless destiny. Because every university possesses unique goals and characteristics, there is no “silver bullet” solution or cookie-cutter approach. Nonetheless, there is a common denominator for success. Wireless 20/20 observes that answering “yes” to the following questions significantly increases the odds of the university to achieve its cellular and public-safety communications goals. Conversely, answering “no” is an indicator for missing desired outcomes. 1. Do you have a well-defined and prioritized vision statement for campus-wide wireless communications based on the SMART Goal methodology (where S = specific; M = measurable; A = attainable; R = relevant; and T = time-based)? 2. Have you established a “wireless task force” that includes key functional area stakeholders, including building and operations management, facilities management, finance, IT, legal, procurement, public safety, security and telecommunications? 3. Do you have a clear understanding of local and/or state public-safety communication compliance requirements (including current and emerging fire codes) and are you holistically aligning your public-safety, emergency notification (including text messaging, email and voice alerts) and cellular communication strategies? 4. 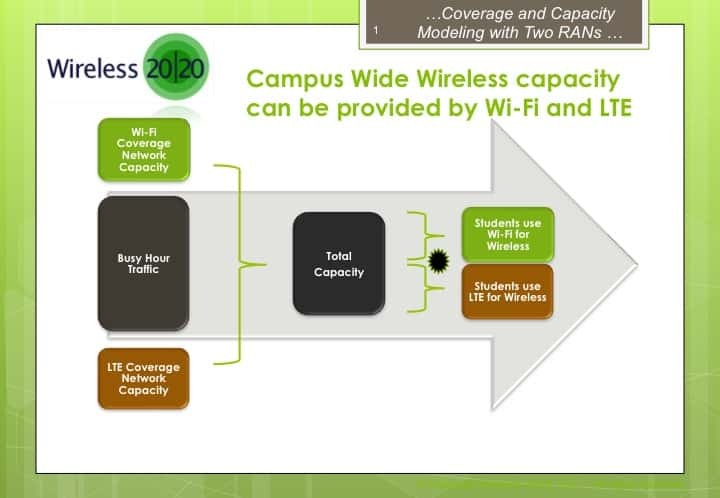 Have you developed a five-year and 10-year network traffic model for a campus-wide wireless communications network that includes subscriber growth, changing usage demand and the technology options for “4G” LTE macro, Wi-Fi, DAS, small cells and “5G” to meet this demand? 5. Have you developed a five-year and 10-year capital expense and operating expense budget for building and scaling a campus-wide wireless network that includes a strategy to entice all wireless operators to participate and contribute? 6. Have you developed a sustainable financial model to fund and monetize your wireless network? 7. Is wireless (including Wi-Fi, cellular, public safety and building automation) part of the building information modeling for all new and future campus buildings? 8. Have you tailored an RFP that reflects the unique requirements of your university (or are you repurposing an RFP from another university)? Few market segments amplify the need for new approaches to achieve cellular and public-safety coverage than higher education, where the chasm between the goals of universities and wireless operators leaves myriad indoor locations and buildings without service. Success requires innovative funding models and technology solutions, as well as proactive planning and partnerships. Are you willing and prepared to fund a techno-economic model for your campus-wide wireless network? Mike Collado helps companies win mindshare and capture market share. He recently served as VP of marketing for Solid where he led corporate marketing, product marketing and marketing communications. Collado serves as a strategic advisor for both industry and nonprofit organizations and is an author, blogger and frequent speaker at wireless industry events. Haig Sarkissian brings over 25 years of experience in the telecommunications industry, with focus on the wireless communication market. As a consultant he has advised over 100 leading 3G/4G service providers and OEMs on strategy, business plan development, technology assessment and selections, spectrum acquisition, as well as partnership development, mergers and acquisition, and investments. His clients span from start-ups to Fortune 100 companies. Wireless 20/20 helps wireless ecosystem stakeholders, including venue owners, mobile operators and vendors, develop their 4G LTE network coverage and capacity strategies, service offerings, marketing plans, technology roadmaps and business cases. More information about the WiROI™ Neutral Host Network Venue Tool can be found at www.wireless2020.com/WiROINeutralHost/. Editor’s Note: In the Analyst Angle section, we’ve collected a group of the industry’s leading analysts to give their outlook on the hot topics in the wireless industry. NextHow Far Does Your Data Center Reach?